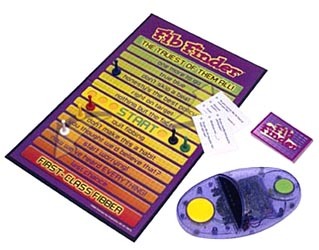 Electronic Fib Finder Game includes Fib Finder, game board, question cards, movers and instructions. Put your friends to the test on special questions you've always wanted to ask. Are your friends telling the truth? The Fib Finder will let you know! Would you rather be voted the smartest or best looking? Do you have a secret crush on someone? Learn the answers to questions like these with Fib Finder. To play, you choose one of three questions on a card to ask your friends (sometimes you can even make up your own). If your friend answers a question and you think he or she is telling the truth, they can move up the game board. If you believe they're fibbing, challenge them with the electronic Fib Finder. Place their finger on the keypad and it will read their mind. Colored lights and sounds will determine if the truth is being told or not, deciding which one of you will have to move forward or backward on the game board. Fib Finder would be a fun addition to a slumber party or afternoon hangout.